I was pretty happy with the first season of The Newsroom and was certainly curious to see how the show would develop moving forward. After all, they tried to make some pretty bold statements about the state of news reporting in recent years and with the intrepid crew of the fictional Atlantis Cable News team trying to make a bit of a difference. The second season of The Newsroom certainly started with a rather interesting story angle and then went right back into trying to address various headlines of recent years. But then also went right back into some of its old relationship drama. As much as this was to be expected, admittedly it has never been my favorite part of the show. If anything, there was a significant shift this time around from putting most of the spotlight on the lead anchor to really pushing this to be more of an ensemble story. I can appreciate the effort put into this shift, but at the same time I can't help but feel things were a little to sudden when you look at the two seasons side-by-side. And there are a number of changes that make me a little worried. 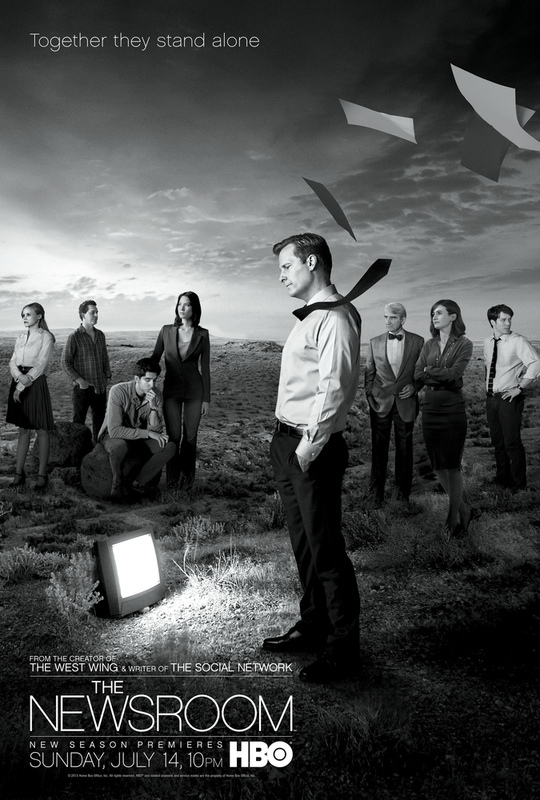 Synopsis: The Newsroom is an HBO drama series created by Aaron Sorkin. Jeff Daniels and Jane Fonda received Emmy nominations for their performances in this season. Various members of the ACN News Night team are being depositioned by corporate counsel Rebecca Halliday (Marcia Gay Harden). In bits and pieces we learn about a particular news story surrounding some military event known as Operation Genoa. This is the major story arc of the season and many of the episodes include the various interviews with members of the team about their perspective of the events of the past year. But in essence, the bulk of the season is actually a flashback as we see what had happened over at ACN and not just limited to the Genoa story. We also get a number of personal developments related to the characters. From the very start of the season we purse a personal angle with senior producer Jim Harper (John Gallagher, Jr.) decides to run off to become the ACN correspondent following the Romney campaign in order to get away from dealing with the situation with Maggie (Alison Pill). Maggie had been living with former News Night executive producer Don (Thomas Sadoski), but the two broke up after Don watched Jim's video where he professes his love for Maggie in public. And there's still a lingering thing between Will McAvoy (Jeff Daniels) and MacKenzie McHale (Emily Mortimer) that seems to be there, disappears for most of the season, then surprisingly comes back at the end in a pretty big way. The show does tackle a number of key news stories of the period leading up to the big finale with the 2012 US Presidential Elections. So we get some glimpses of Occupy Wall Street, primarily from the perspective of everyone's favorite fact machine Neal (Dev Patel), the Egyptian uprising and even the resignation of CIA Director David Petraeus. But if anything, the news coverage felt a lot lighter this time around since we focused on more of the behind-the-scenes action. Well, I guess we can call it action. It disappoints me how it felt like most of MacKenzie's most meaningful scenes were limited to the control booth or perhaps the briefings where they discuss the news of the day. Sure, this is really her kingdom as executive producer, but given how much focus she had in the first season, we also saw a drastic shift away from her this time around. And that sort of resulted in more time for the other characters, but a lot of that was burned on Jim trying to be all noble during the Romney campaign and yet can't deny that he's not really supposed to be there. Maggie had a big story arc that was important for a while but then it just sort of lingered in the background. Her experience in Africa was certainly a powerful moment and I liked how they tried to depict its effects initially. But at the same time, the writers were quick to shove this onto the backburner and sort of letting it get eclipsed by the Jim drama again. Frustrating. Instead of the whole point about News Night trying to do something different with news reporting, thi season felt like it was a lot more business as usual with things. The shoddy coverage of Occupy Wall Street was a clear example of this and of course the greater obsession with the Genoa case. And while that was an interesting enough story element, I don't think it needed to dominate the conversation as much as it did, especially given how it was ultimately resolved. And I don't know if it was the best idea to have sarcastic comedian Hamish Linklater play the role of the temporary replacement for Jim. This second season of The Newsroom was decent enough, but I don't think it quite knew what it wanted to tackle after resolving the main arc of the first season. Back then it was all about proving that they could be different and that they could be more responsible in terms of their news reporting. Now everyone just seems bitter and the Genoa story didn't help things at all. So I can only rate this as 3.5 moments of Neal obsessing over social media posts out of a possible 5.